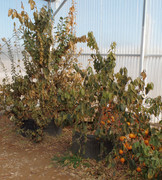 37 citrus grafts, disease free budwood, HLB, etc. "One of the biggest threats to the citrus industry is the spread of disease by movement of plants or receiving budwood from an unknown, uncertified source. We spend over $40,000 annually in an extensive testing program for our Foundation and Scion source trees. All trees are individually tested for Huanglongbing (Citrus greening) , Citrus tristeza virus, Citrus Tatter Leaf virus, Citrus leaf blotch virus, Citrus psorosis virus, Citrus exocortis viroid, Hop stunt viroid, and Citrus dwarfing viroid. Therefore I again encourage you and others to always order from our program. It will be well worth the cost to ensure that you are receiving clean, pathogen-free, true-to-type citrus budwood." My 4 cocktail trees now have these oranges - Hamlin, Marrs, Calamondin, Olinda Valencia and the bloods - Moro and Tarocco. Lemons - Meyer, Pomona seedless (cold hardy into the teens FWIW). Limes - key, limequat (cold hardy substitute) and Persian. And don't forget the clothespins when doing T-buds. Trust me, that's the easiest way to really clamp down to insure good cambium contact on wood that's up to 1/2" in girth. Beats the helluva rubber bands and vinyl tape. The Buddy Tape helps cushion any epidermal tissue damage. I remove them after 2 weeks. Re: 37 citrus grafts, disease free budwood, HLB, etc. Very interesting ...esp as i have just started looking into doing some of this myself..
Brian, for new grafters I think you will have good success with cleft grafting, Just make sure the stock and scion are about the same size is with. Sorry to hear that! Use Buddy tape and most of all the right knife: a Schick injector blade in a Xacto knife or #3 medium Excel holder. It will make all the difference in the world. Rootstock bark should be easily slipping so that the flaps open nice and clean showing a white cambium. Watch for any crud that may have gotten on to the cambium and clean it out with the blade or your fingernail. I do my cuts with my Schick (after sterilizing the blade and my hands with a spritz of 70% alcohol) and use the blunt side of the blade to open the bark top to bottom. You should have 100% takes if the budwood is in the right condition and the rootstock bark is slipping. The first of the year I got a lot of takes doing cleft grafts of green upon green, triangular wood. Back in January thanks to a heater failure all my trees froze back to nubs and are now like they're on steroids. I'm keeping the key lime below 9' for example with numerous tippings. March 6, death warmed over. I am using a "Zenport K106" grafting knife which is just what showed up when I searched for a grafting knife on amazon. I think the bark is not slipping and I'm having to force it too much. Also, I keep dropping the buds and I expect they are getting contaminated. They are difficult to hold onto even if I leave a bit of leaf as a handle. I'll keep at it, its nice to know that success is nearly certain with the right technique, and I simply have to improve my technique. If you have to force the bark off the cambium resulting in tissue damage either to the bark or cambium underneath it then you've chosen a rootstock branche that is too old/thick or the wrong time of the year when it's not slipping. Open up that first photo I posted to look at the missing budeye I took off. No leaves left on, only use budsticks as shown. Dormant budeye should be evident and ready to swell and push. Yeah, Brian, keep trying. My Grandfather could graft a stick onto a rock, but I didn't get his grafting genes. However after several failures, I am starting to have some successes. It takes patience and determination and a little bit of luck, but the results are worth it. I think chip budding is easier. Not just right technique, but with warm temps most citrus grafts should take and the plant will forgive some bad technique. You maybe better off with cleft or veneer grafts and leaving the bud grafting or chip budding for when you are more experienced (sorry if I’m assuming you don’t have as much experience... just seems that way from your post). I’ve been having scions lush within a week this past summer. I grafted earlier in February/March and didn’t have pushes for a couple of months when temps were cooler. Active growth makes a big difference it seems. Active growth makes a big difference it seems. Yes it does and bud swell helps big time. I got free replacement for the Marrs orange and the budeyes and sticks are in much better condition than what was sent to me 4 mos. ago by a friend who put in an order. T-bud - IMO is it one of the easiest and most successful grafts you can do. I get 100% takes as long as the sticks (budeyes) are in great shape. A no brainer regarding cambium matches. When you open up the rootstock flaps, bam, it's all right there - the light green cambium. As long as you make a clean straight cut about 1" long and at least 1/8" thick and wide of the budeye area you'll get a perfect cambium match. it's like sticking a plug into a wall socket!